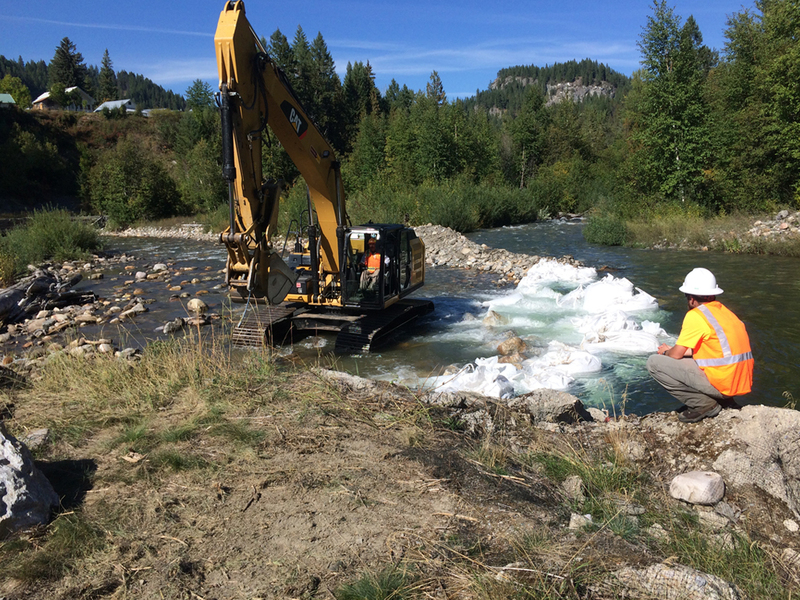 NRC completed a stream bank isolation and stabilization project in Metaline Falls, Washington during September of 2015 for a national Engineering and Consulting firm. The purpose of the project was to improve the riparian area adjacent to Sullivan Creek against erosion and spring thaws because the area housed an existing ground water treatment bank. Crucial to the success of the project was completing the work before the end of September in order to coincide with migratory fish patterns and fall water flows. Site preparation tasks included the installation of streamside erosion and sedimentation controls, turbidity curtain and fish curtain. After those controls were installed, NRC implemented a fishing herding program, which was specified and overseen by multiple regulatory agencies and involved NRC technicians manually herding fish downstream. 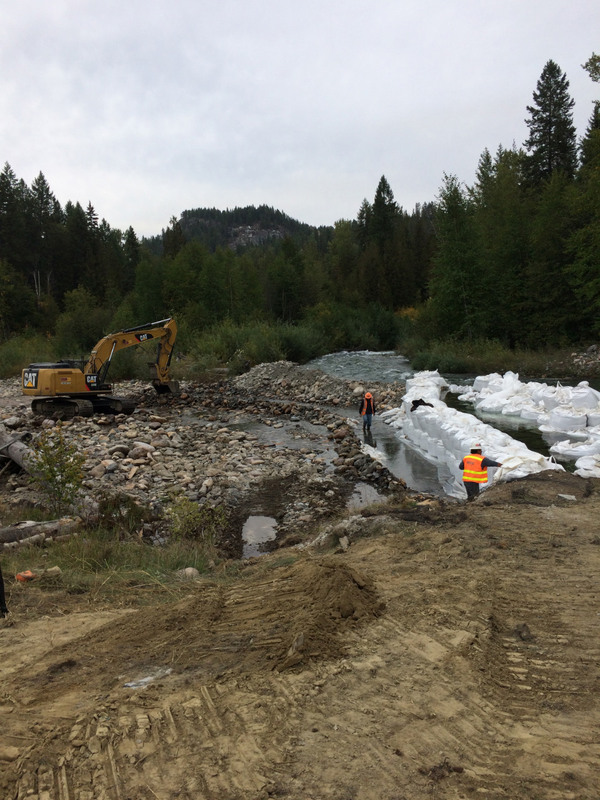 Diversion of the stream flow was accomplished by a diversion structure consisting of CY sandbags which diverted flow into a nearby seasonal channel upstream of the work area. NRC was challenged by the flow of water increasing in the river from 50 cubic feet per second (cfs) to over 220 cfs on the day of mobilization due to an unexpected release of water from a municipal dam 3.5 miles upstream of the work site. Without any time to switch water diversion structures, NRC’s project team gang tackled the problem by enhancing the water diversion structure. NRC installed a secondary structure immediately downstream of the initial diversion structure. A small drainage trench was installed to relieve pressure from the diversion and route a manageable volume of water away from the work area. An 8” dry prime diesel powered pump was also mobilized and utilized in the de-watering efforts. Once Sullivan Creek was successfully diverted away from the treatment bank NRC started the stabilization process, which began with skillful clearing of vegetation from atop the treatment bank. Existing gabion baskets were realigned, filled, and compacted with imported aggregate material. 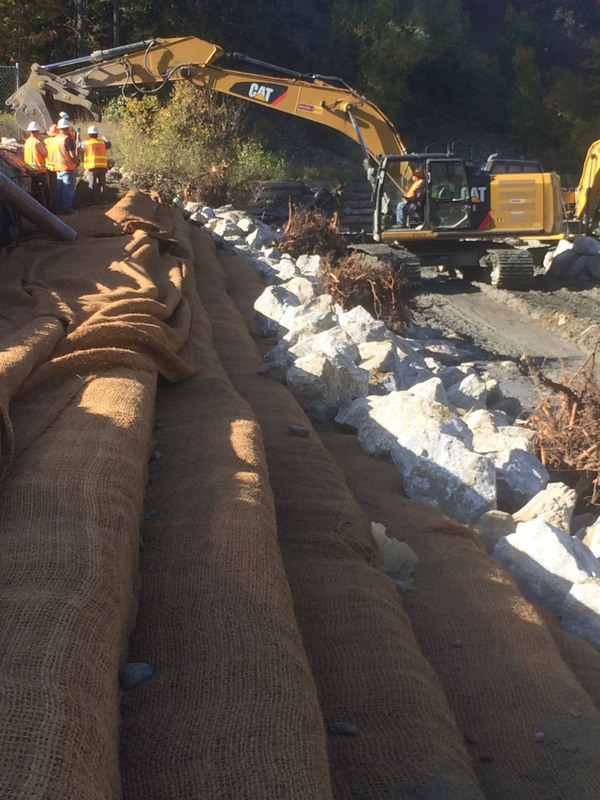 NRC installed and anchored non-woven geotextile over filled gabion baskets. Next, NRC installed coir soil encasements in a terraced fashion along the slope of the bank. The entire bank was covered with large boulders to aid in the erosion control. The encasements and entire disturbed areas were then planted with approximately 300 live stakes. NRC installed two permanent habitat improvement structures that also served as water diversion structures and three single inverted trees at the toe of the embankment. The structures consisted of inverted logs installed upside down into the river bed with the root wads at or just below the water’s surface. The rest of the diversion structure consisted of large boulders installed out into Sullivan creek thereby deflecting water flow away from the treatment bank. NRC replaced the stream bed to its original state working downstream to upstream with imported cobbles. NRC’s crews worked 7 days a week from mobilization to demobilization in support of the critical project schedule without any health and safety incidents.